Jesus reaches out his hand kindly and said, "I am willing; you may be healed now." HEN JESUS AND his twelve disciples came down from the mountain, a great multitude of people followed them. These people had come from cities and villages in every part of Galilee, and some had come even from Jerusalem and from country places in Judea. Near this great multitude stood one poor man who had heard of Jesus' power to work miracles. And he needed, oh, so much! to have a miracle performed in his body; for the terrible disease of leprosy had fastened on him and was eating his flesh. He was not allowed to live among his friends and relatives, for fear they might become lepers also. He was not allowed to come very close to any one who was not a leper. And what an unhappy life he lived! When the poor leper saw Jesus and his disciples coming down the mountain-side, he thought, "I wonder if this Jesus will heal me." He decided to try him, so he ran to Jesus and knelt down on the ground at Jesus' feet, worshiping him. Then he said, "If you are willing, I know you can make me well from this terrible leprosy." Jesus looked on the poor man kneeling before him, and great pity filled his heart. He knew how this man was dying, by inches, of the dreaded leprosy, which no doctors could cure. He knew about the unhappy days this poor man spent away from his own home and loved ones. He knew, too, how careful every one was to keep away from a leprous person for fear he might becomes a leper also. 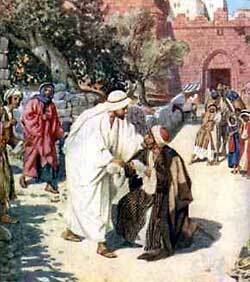 Jesus was not afraid to touch the poor leper. He reached out his hand kindly and said, "I am willing; you may be healed now." And at that moment the leprosy left the poor man's body and new skin came upon his flesh. The man sprang quickly to his feet, and the weary look had vanished from his eyes. Now he was well! How thankful he felt. No doubt the great change seemed too good to believe. But he saw how the leprosy was gone, and he knew Jesus had touched him and had sent healing power through his body. In the law of God that Moses gave to the people, he commanded that lepers should offer sacrifices of thanksgiving to God when their leprosy was healed. So Jesus reminded the man of this command, and told him to go to the priests in Jerusalem and make an offering to God. And he asked the man to tell no one about the healing. But soon the news of this great miracle spread over the country-side, and every one was talking about it. The poor man had been so glad that he had told his friends what Jesus had done for him. And his friends told their friends, and so the news spread far and wide. And many people left their homes and rushed into the country to see the wonderful person who by his word and by the touch of his hand could drive away the leprosy from a man whose body was full of the dreadful disease.